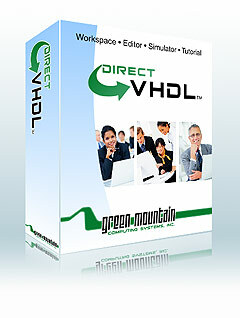 Learn VHDL the direct way with our low-cost, interactive VHDL simulator. DirectVHDL is built around a VHDL interpreter that allows you to edit and simulate your VHDL design without complicated setup or compilation procedures. DirectVHDL simply loads and simulates in one step. Now $49, DirectVHDL is great way to get started with VHDL. Buy Now! from our secure on-line store. DirectVHDL is no longer available. • VHDL Workspace - an easy-to-use manager that serves as a starting point to launch the VHDL editor and simulator. • VHDL Editor - an advanced editor providing syntax coloring and syntax-error detection. Perfect for beginners, this editor highlights syntax errors as you type! 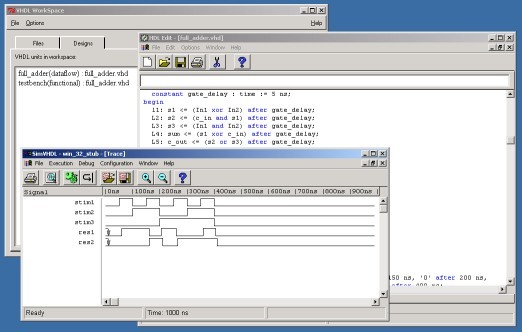 • VHDL Simulator - allows you to simulate and debug your design with a graphical waveform viewer. • VHDL Tutorial - provides an easy introduction to the VHDL language. See DirectVHDL for Mac OS X page. • The group and reject keywords are not supported. • Configurations are not completely supported. • Libraries are not supported except the builtin IEEE libraries (std_logic_1164, numeric_bit, numeric_std, std_logic_textio, std_logic_arith, std_logic_signed, std_logic_unsigned).